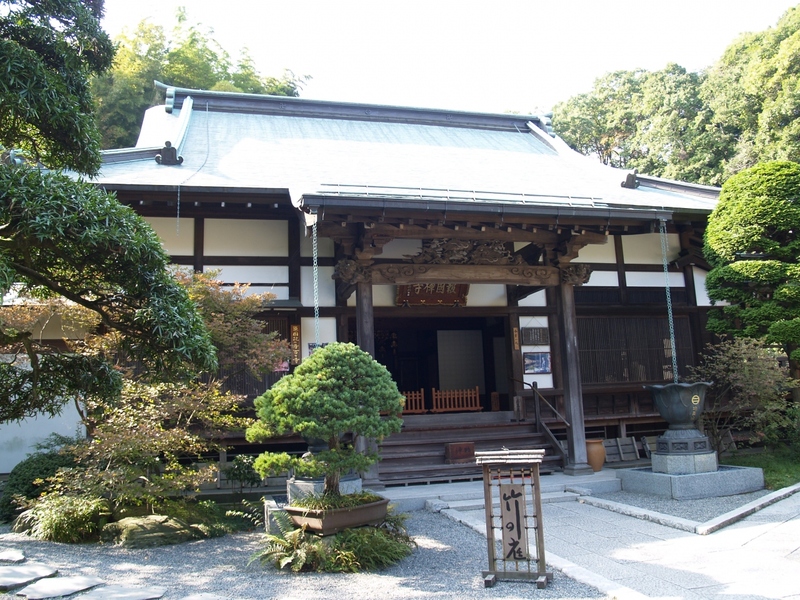 “Hokoku-ji Temple” along the Kanazawa-kaido road in Kamakura is a temple of Rinzai sect which Ietoki ASHIKAGA opened. 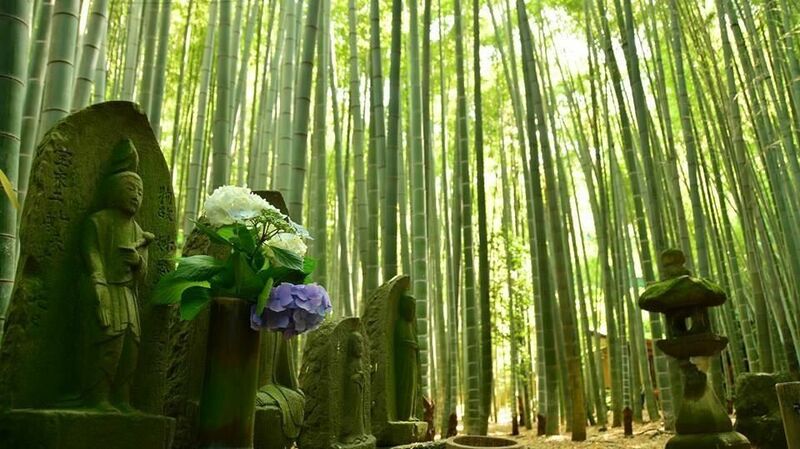 About 1,000 Moso-chiku (thick-stemmed bamboo) grow in the precincts and it is known as a beautiful temple of bamboo groves. It is a small temple in the residential area. There is not spectacularness or magnificence. But, as you step into the bamboo forest behind the main hall, another world spreads out there. The scenery where Moso-chiku extending towards the sky is lined up on both sides of the street is the beauty of a masterpiece. 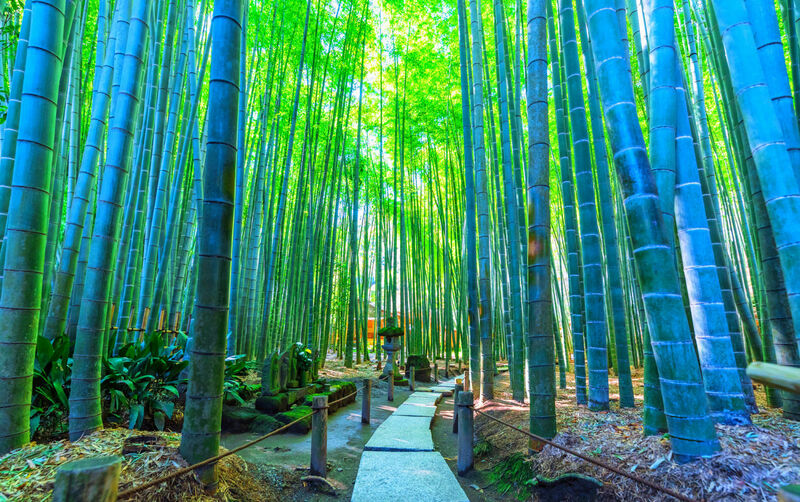 Bamboo forest absorbs sounds, so you can hear almost anything other than the sounds of the leaves shaking in the wind. Nature’s green has a calming effect. Walking a little over time, or watching bamboo groves and having sweets and green tea slowly is also good. In the precincts of Hokoku-ji Temple there are planted hydrangeas, daffodils, plums, etc. besides bamboo, and beautiful flowers can be seen every season. In addition, there are more than ten kinds of moss growing in the precincts, and it seems that it covers not only the ground but also rocks and stone towers as green carpet. After taking a walk through the bamboo grove, if you stop looking at the moss and the flowers in the precincts, the Hokoku-ji Temple will be more attractive. The main hall of Hokoku-ji Temple was built in the period of the Northern and Southern Dynasties (439 – 589) and is designated as a cultural property in Kanagawa Prefecture. The seated statue of Shaka Nyorai enshrined inside is Hogen Takuma work known for drawing To-ji Temple’s Twelve Devas. Hokoku-ji Temple, famous for the beauty of bamboo groves, Karesansui garden (dry garden style) is also superb. 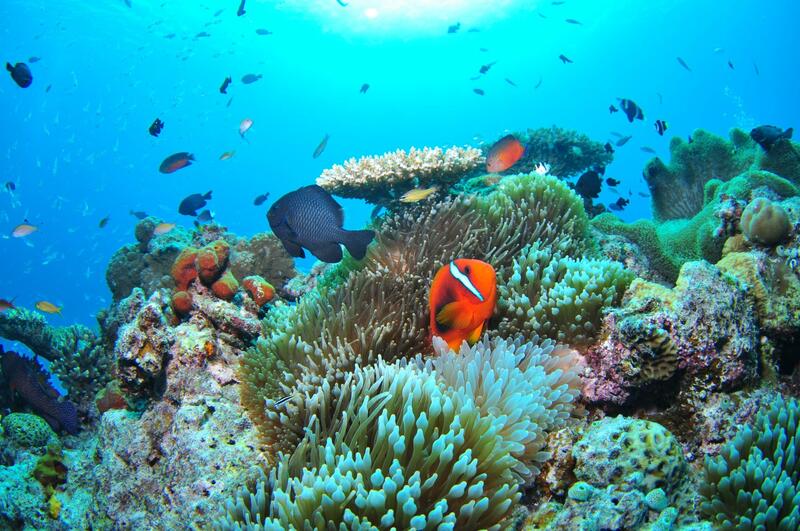 The contrast between white sand and moss green is particularly beautiful, and you will not get tired of watching it. It is early summer when the green of moss becomes most beautiful. You can enjoy the colored leaves of trees in autumn. 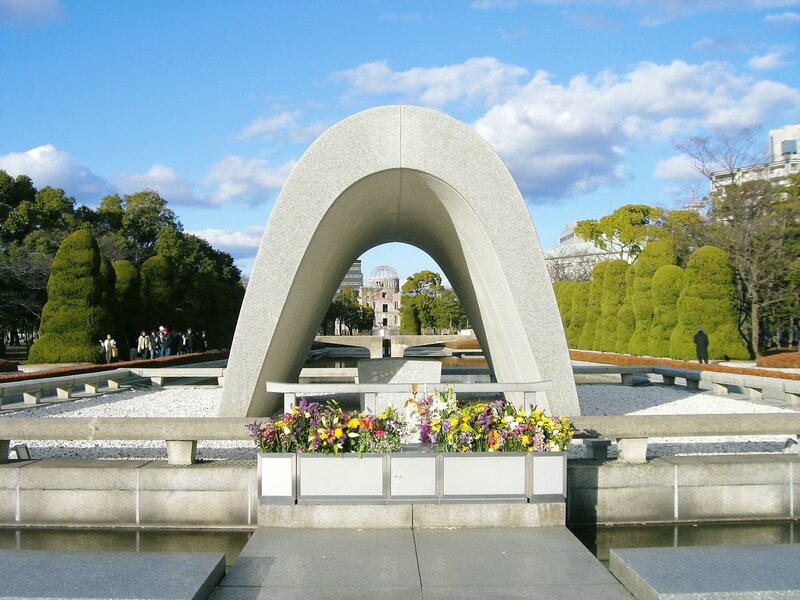 Since it is not crowded in the daytime on weekdays, those who want to visit slowly and take pictures are recommended to visit at this time. The Hakoku-ji Temple’s Karesansui garden is located behind the main hall, as well as on the left side of the approach road through the mountain gate. Although the scale is not so large, you can see the pattern drawn on white sand at hand, and it is a must for garden lovers. 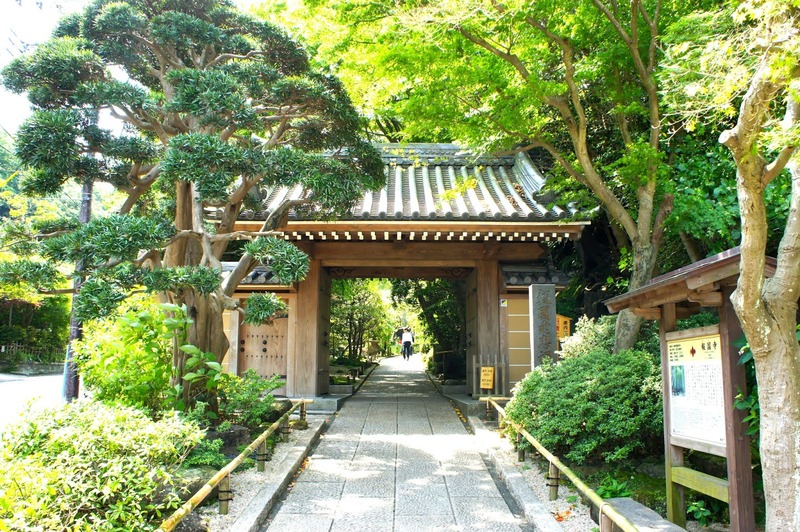 Hokoku-ji Temple is a little away from sightseeing spots such as Kamakura and Kitakamakura, so it takes some time to visit. 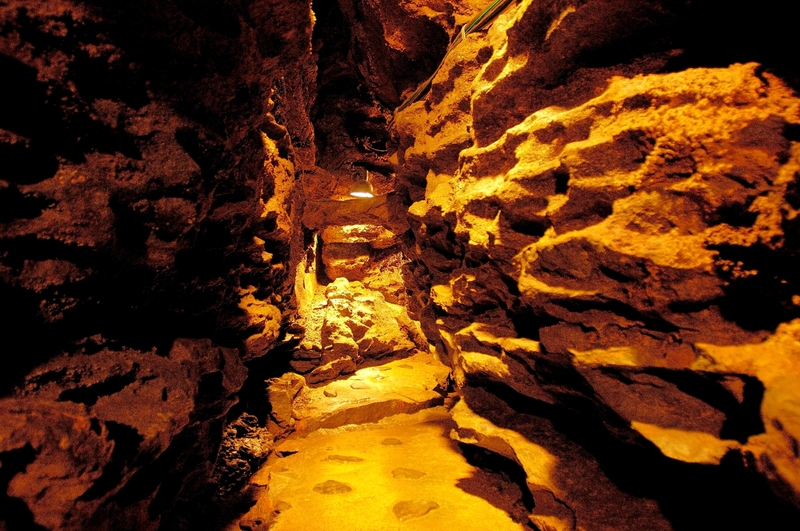 However, there is a place worth visiting even if it takes time. Bamboo is a plant with beauty that does not change all year round, so it is okay to visit any season. From late May to early June when hydrangea blooms beautifully, it is crowded but transportation is available if otherwise. Hokoku-ji Temple in Kamakura-shi, Kanagawa is also called the alias “Takedera Temple” because Take-bayashi (bamboo forest) which spreads on main hall’s reverse side is wonderful. You can take a walk along a promenade in the bamboo forest, so it’s possible to sense the peaceful atmosphere. It is said that this Takedera Temple was founded around 1334 by Ietoki ASHIKAGA who was the grandfather of the first general of Muromachi shogunate government Takauji ASHIKAGA. It is the temple with nearly 700 years history. Although the official name of this temple is Hokoku-ji Temple, there are many people who remember by a name called Takedera Temple. This temple is famous for the yard of the bamboo as the name. In the main hall’s back hand, the yard of about 2,000 Moso-Chiku (thick-stemmed bamboo) spreads out. The yard in the shade under tree where sunbeam shines through branches of trees is beautiful particularly, and becomes feeling to look at forever calmly. 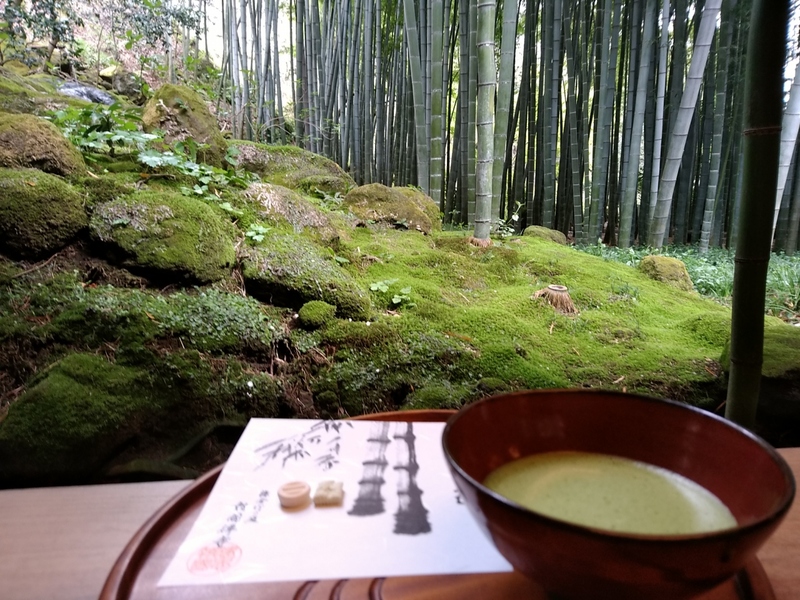 There is the tea-ceremony room as Kyukoan in the garden of the bamboo, and when paying 500 yen, you can receive powdered green tea and sweet Japanese-style confectionery. The powdered green tea drunk on the fine while looking at sunlight overflowing from between bamboos day is exceptional. The mysterious view is also spread on a rainy day, and you can experience it tastefully. It’s possible to enter the precinct in Hokoku-ji Temple for free of charge. There is an entrance to Takebayashi beside the precincts of the temple, and the admission fee of the yard of the bamboo is paid there. It is necessary to also pay the price for the powdered green tea in Kyukoan in the inner part of the yard of a bamboo here. 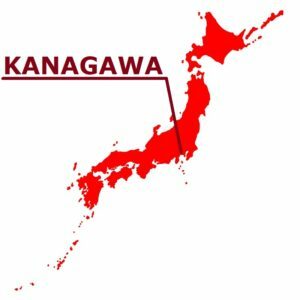 “Takedera” in Kamakura is chosen also as three-star of the Michelin guide. The beautiful scene used for a movie, photography of television, etc. is the place of certainly worth seeing. You’re wrapped in the silent atmosphere and can feel like having time-travelled.